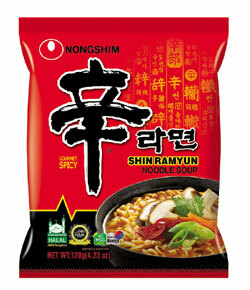 Nongshim’s Shin Ramyun received halal certification in 2011. Halal means “lawful” or “permissible” in Arabic. Halal certification can be given to food items that are slaughtered, processed or manufactured according to Islamic law and which are permissible for devout Muslims to eat. In order to penetrate predominantly Muslim markets, food makers cannot add pork, alcohol or meat-derived food ingredients such as collagen. 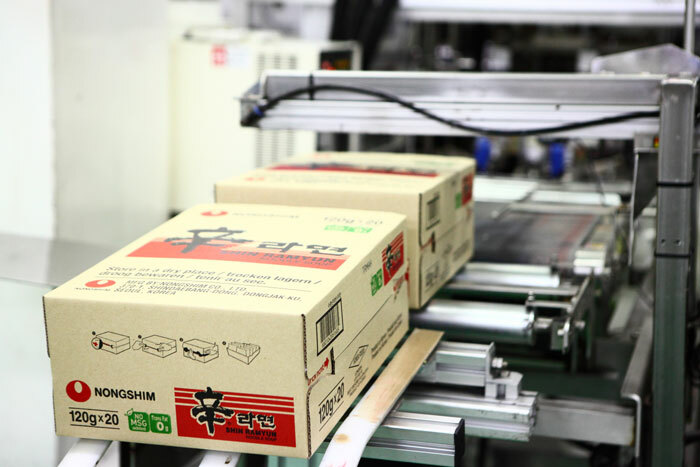 Nongshim, a snacks and noodle maker, is one of the enthusiastic Korean firms that are prepared to get halal certification. The company built special production facilities at its plant in Busan and started producing halal-certified Shin Ramyun and Yukejang Noodle Soup in 2011. Nongshim recorded sales worth USD 0.9 million in the first year after launching these halal instant noodles. Currently, these products are exported to such countries as Saudi Arabia, Qatar and the United Arab Emirates. As of November 2014, Nongshim recorded USD 2.5 million in sales of these products. Nongshim built special halal food production facilities at its plant in Busan in 2011. In 2013, CJ CheilJedang, another food processor, received halal certification from the Malaysian Department of Islamic Development (JAKIM) for a total of 433 of its products in three categories, such as cooked rice, crispy seaweed snacks and sliced kimchi. CJ has been exporting its halal-certified food to Malaysia and Singapore. It plans to export to more countries, such as Indonesia and to the Middle East. CJ’s crispy seaweed snacks and sliced kimchi won halal certification from the JAKIM. There are also hahal certified Korean snacks and bread items. About 87 kinds of Korean snacks are halal certified. These snacks include Pepero, chocolate-coated bread sticks, and the nutty flavored Corn Snacks by Lotte Confectionery. Crown Confectionery also won halal certification for its Kuk He, a chocolate-creamed cookie. Choco Pies, made by the Orion Group, substituted plant components for pork-based gelatin in order to get halal certification. 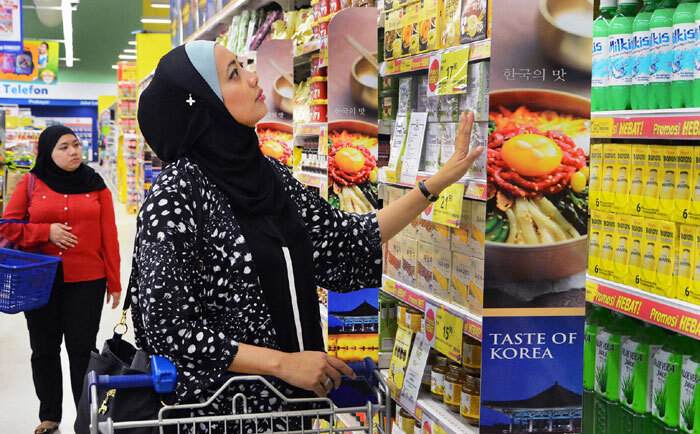 About 20 Korean food companies that received halal certification participate in the ‘Taste of Korea’ event, held at 20 Tesco locations across Malaysia from late November to early December last year. In the above photo, Malaysian customers at the Tesco Mutiara Damansara store peruse Korean food products during the ‘Taste of Korea” event. Halal-certified Korean food is also winning attention overseas. The Ministry of Agriculture, Food & Rural Affairs and retailer Home Plus received a favorable response from Malaysian customers during its special “Taste of Korea” event held at 20 TESCO branches across Malaysia in late November and December last year. About 20 Korean food companies, including Nongshim and Lotte Confectionery, participated in the event. They promoted approximately 150 kinds of food products, ranging from kimchi, seaweed and gochujang or pepper paste through to beverages, instant noodles and confectioneries.